I was born in A Coruña, a beautiful city in Galicia, Northwest Spain, in 1986, where I grew up surrounded by people who worked with their hands. They awakened my interest for traditional handcrafts, what set an important basis for my future. Lego, Meccano and fairs where I was amazed by the weavers, woodcarvers and woodturners are part of my dearest memories. I studied architecture for 2 years, where I learned a lot about design, structure, construction and form. However, I felt like a needed to work more with my hands. So I decided to change my course to woodworking. 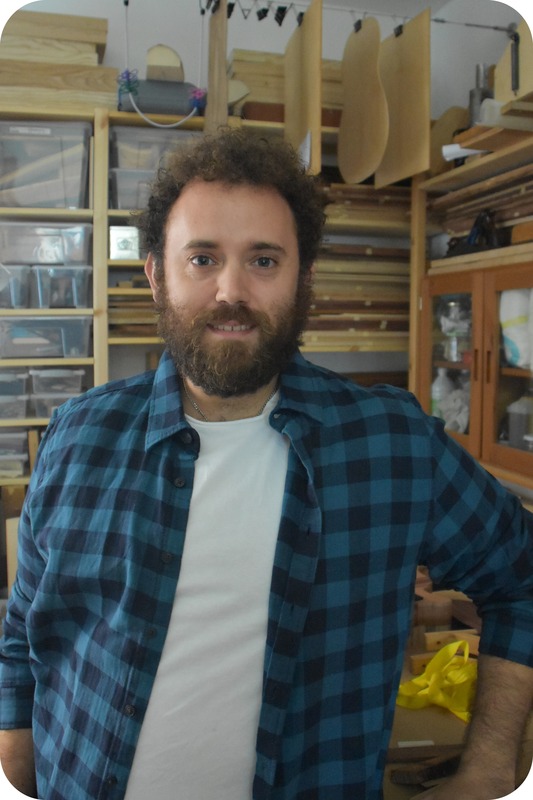 Music and guitars were two of my biggest hobbies, therefore after finishing the degree in Furniture Design and Making in Vigo, during summer 2009 I made my first guitar with luthier Jean Pierre Sardin in Barcelona. After it, there was no way back: I was already hooked on the instrument making. That same year I started, also in Vigo, in the School of Arts and Crafts, a 2-year-course in Ancient Lutherie, where I learned to make viols and renaissance lutes under the tutelage of master Ramón R. Casal. In the summer of 2010, I went to Sigüenza to learn how to make a vihuela, learning traditional Spanish methods with masters José L. Romanillos, Jaume Bosser and Joan Pellisa. Friends, lectures, activities, concerts and other projects keep taking me back every year to Sigüenza. After these two years in Vigo, I decided to do the Guitar Making Course in Newark-on-Trent, in Nottinghamshire, UK. Here I learned more in depth how to make guitars (classical, acoustic and electric) and mandolins with masters Adrian Lucas, James Lister, Mal Brady and Geoff Goddfrey. In summer 2012, I returned to Sigüenza as a student in the Romanillos Guitar Making Course, where, under the tutelage of masters José L. Romanillos, Liam Romanillos and Steve Rees, I made a Spanish guitar following their methods and advices and making the most of the multicultural atmosphere of the course. After 2 years in Newark, I decided to move to Belgium in 2013, to study Restoration of plucked instruments at ILSA (International Lutherie School of Antwerpen). Since September 2014, after finishing the Restoration course, I am one of the guitar making teachers at ILSA. Currently I live in Antwerp and I combine the construction of my instruments with this teaching activity, always learning, exploring and trying new ideas and working hard. It is a true privilege and a real pleasure to be able to do what I love and keep learning every day about my work.